I am obsessed with Christmas ornaments ever since teenage me got my first few handmade Christmas decoration from my grandmother as a present. By the time I struck out into the big wide world, I had a variety of Christmas ornaments to decorate with that was a nice change from the red glass ball ornaments that hung on my parent’s tree. I love the variety of ornaments Husband and I have collected over the years but I guess absence makes the heart grow founder. Ever since I saw the gigantic Christmas ball ornaments for sale to commercial spaces (malls, outside a business, etc.) 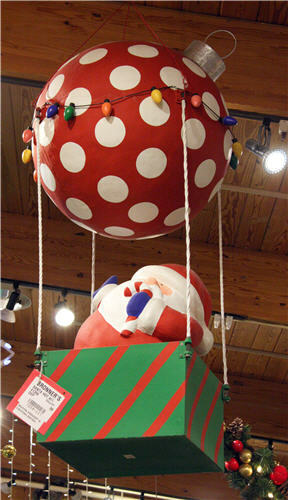 at Bronner’s Christmas Store during our vacation a few years ago, I lust after round ball ornaments – super sized! I adore everything about this cherry Santa decoration from the happy polka dots and lights to the cartoony Santa. If only I had mile high ceilings and enormous living room…. Keep reading! 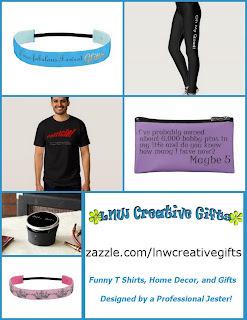 I'll teach you how to make this fun decorating idea! 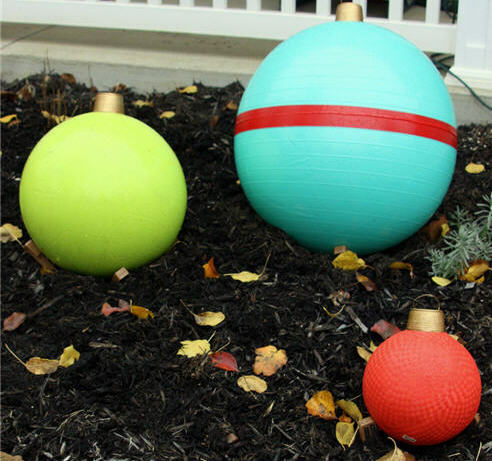 Let’s make Big Christmas ornaments from exercise and playground balls! 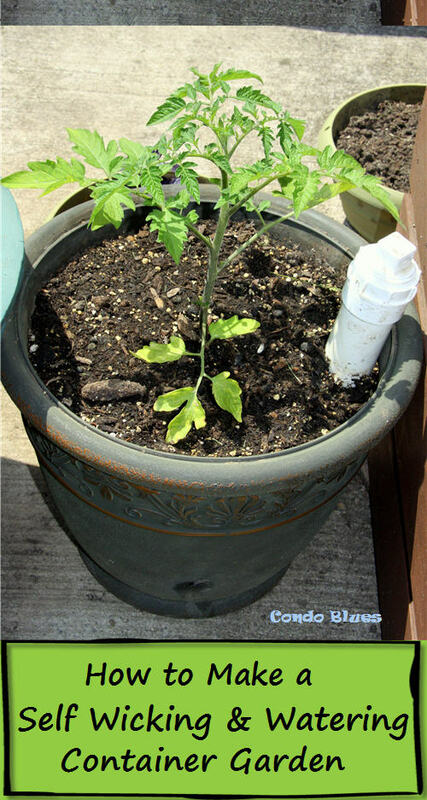 Pin this quick and easy tutorial for later! I am using three different size exercise and playground balls so I get a natural Decorating Rule of Three - low, medium, and high object to display. Feel free to decorate with the same size ball or mix it up as you like! 1. Optional: Paint the balls with a coat of primer. 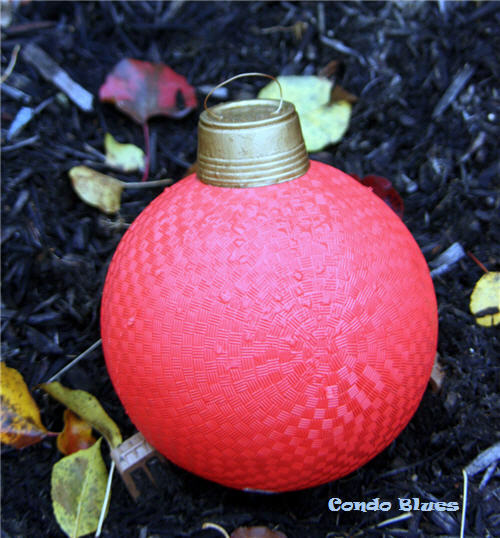 After the primer is completely dry use the spray paint for plastic to paint your homemade ornament balls if desired. The only reason why I painted my 18 inch playground ball a solid bright green because it looked like a giant soccer ball. I would have left it unpainted if the ball was a solid color or had a design that looked more like a decorated Christmas ornament. I avoided painting logos out of the yoga and dodge balls by using that side as the bottom of the ornament. Sneaky! Sneaky! 2. Use the scissors to cut top from the plastic cups to make the ornament hanging cap. I eyeballed and cut the cup cap for each ball larger or smaller to correlate to the size of play ball I am using. 3. 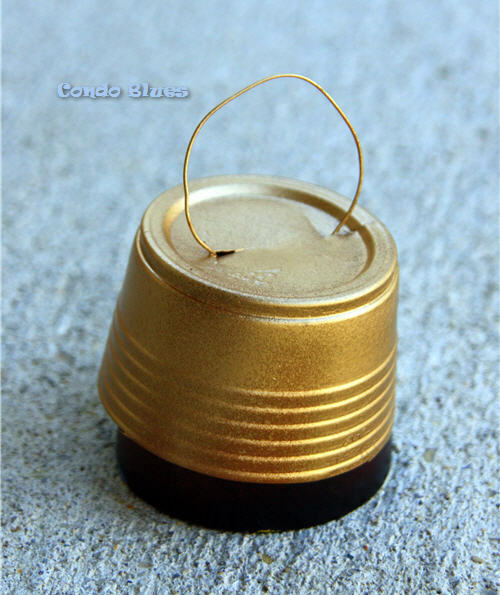 Cut a length of wire with the wire cutters, poke each end of the wire into the sides of the plastic cut to create the ornament hanging loop and use the E6000 to glue it into place inside the cup. 4. Paint the plastic ornament caps with a coat of primer. After the primer is completely dry use the gold spray paint for plastic to spray paint the caps gold. I used two coats of spray paint per cup. I’m using spray paint primer first to keep the colored spray paints from drying sticky and flaking off. 5. 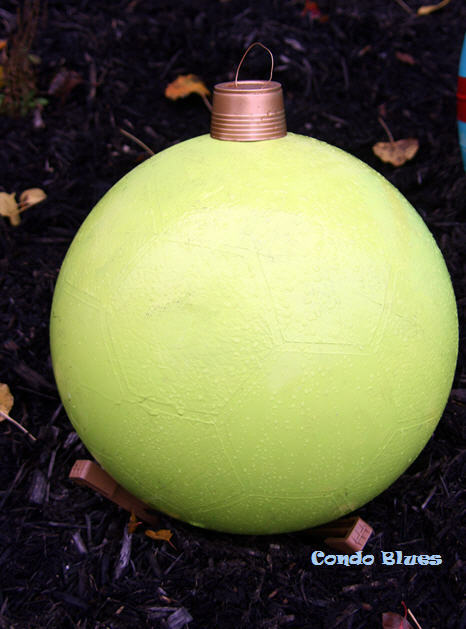 Use the E600 glue to attach each ornament cap to its coordinating playground ball. WARNING: Do NOT use hot glue for this project or you run the risk of melting the plastic balls, deflating your ornaments, and that will you sad. Don’t be sad. It’s Christmas. Be happy! 6. Decorate your homemade giant Christmas ornament decorations with the red Duck Tape if desired. Under inflating the balls helps to keep them from rolling away. I also dug a little crater in the mulch and used garden stakes and bricks twine to anchor my outdoor Christmas decorations so they don’t blow or roll out of my yard. 7. 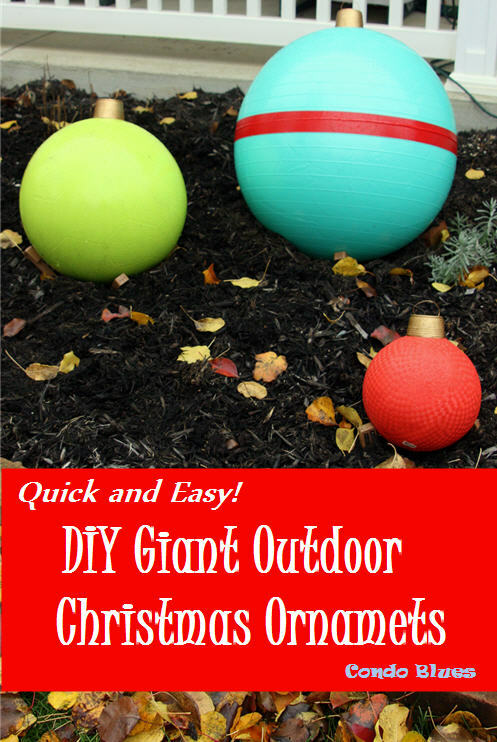 Stack your gigantic DIY Christmas ornaments in your yard or porch, decorate, and celebrate the season!